In this section you can find out more information about some of our Major Projects. We are excited to announce that we have now officially named and developed a logo for our mountain bike trail projects. The idea behind keeping the name simple was because when we did research on other Mountain Bike trails, no matter what they are named, they tend to become associated with the location they are in. For example, Rotorua, Whistler, Maydena, Derby etc. The idea behind the use of the eagle was because we felt it represented the environment and freedom and of course both sea eagles and wedge tail eagles are found in our area. The use of the colours represents the forest to the ocean with the orange representing our lichen covered rocks for which our area is known. We have also developed an information pamphlet which we will be using to promote the trails at the Enduro World Series in Derby this weekend. 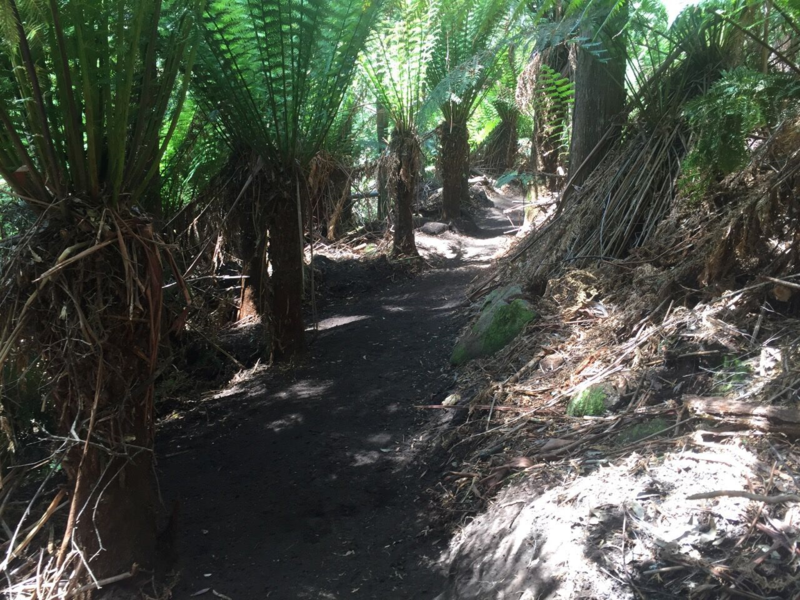 In terms of the trail development, the Bay of Fires trail is well and truly underway with 25 km already completed. We plan to start construction of the stacked loops in April 2019. We also now have a webpage which is where you will be able to find all the information on the trails. 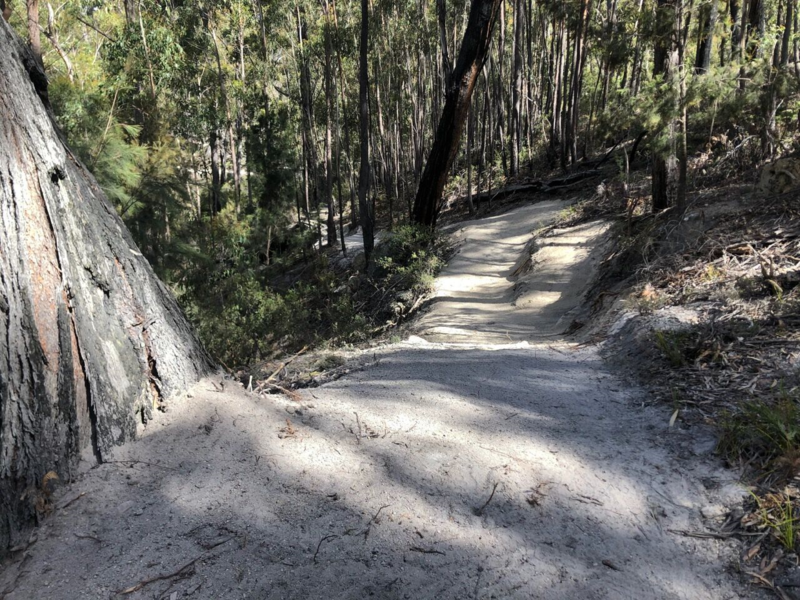 The tender to construct both the St Helens Mountain Bike Network and the Poimena to Swimcart beach descent was awarded to World Trail in October 2018. Construction of the Poimena to Swimcart Beach Mountain Bike Trail started just before Christmas and is now well and truly underway. As this trail is being built in an environmentally sensitive area, all care is being taken to ensure the sustainability of the trails. This includes protection of notable flora species, minimal damage to the natural environment and the trail construction crew washing down machinery and their boots when entering and leaving the area. Once the trails have been completed, bike washdown stations will be provided for riders as well as an education campaign around the importance of protecting this area. There are currently three construction teams from World Trail in the area. Work stopped for the Christmas/New Year period. It is anticipated that the Poimena to Swimcart beach trail will take 8 – 12 months to complete. The St Helens Stacked Loop project construction is currently on hold as we work through an appeal lodged against the Planning Approval. We anticipate that this will be resolved by the end of February. Once this is resolved, World Trail will start trail construction. World Trail have indicated that this should take 12 – 18 months to complete. The St Helens stacked loop network will feature a trail head complete with recreation area with the view to host events into the future. There will also be shuttle drop-off and pick up areas as well as short term parking. Once the concept designs are completed we will share them here. Late last year, we awarded Kingthing the marketing and branding tender which will see ourselves and other important stakeholders including business and community representatives working closely with them to develop a brand, including names and a visual identity for our projects. Poimena to Swimcart Beach Trail. The planning process was approved by council at the meeting of Monday 3 September 2018. There were no appeals received during the 14 day appeals period so construction will commence once the conditions of the Development Planning conditions are met, tender is awarded and contractors are available to start. The St Helens Stacked Loop Network. The planning process for the this component of the project was also approved by council on the meeting of Monday 3 September 2018. There has been an appeal received on this component of the project and is currently being worked through to ensure the conditions are acceptable by all parties. We are hopeful to have this resolved by December 2018 so works can commence on ground prior to the end of 2018. As stated previously, work on both projects is intended to occur in parallel and take approximately 18 to 24 months to complete which places us in late 2019 to early 2020 for completion of the trails. Once contractors are appointed we will firm up a program and keep the community informed. The contract for the trail construction has been awarded to World Trail and have already begun planning, resourcing in preparation to commence works as soon as they can once all conditions are in place. 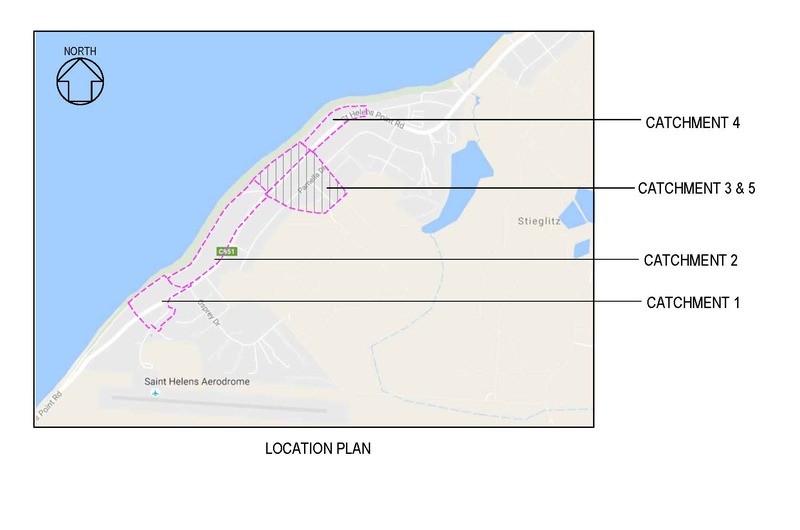 Work will progress on the Poimena to Swimcart Beach Trail and The St Helens Stacked Loop Network in parallel but it is likely the Poimena trail will have a strong focus initially until the St Helens Network has all the approvals resolved. The Brand and Marketing Strategy Expressions of Interest close on August 10. From here applicants will be shortlisted with our goal to appoint a specialist by the beginning of September. We included the development of a brand and marketing strategy as an action for this project as we recognise the importance of getting this correct. We want our trails to be positioned uniquely in the state’s increasing offering of MTB trails and we want to ensure we have all the right ingredients to produce a successful brand and strategy. As this project progresses we will be sure to keep you informed. If you are interested in working with World Trail on this project please contact them directly by following the link. Landslip mitigation works have now started again after the Christmas break. Works will cross Egret Street with a pipeline heading towards Aerodrome Road on the Southern side of St Helens Point Road. A large pipe will also be laid in Parnella Drive from house numbers 80 – 89. After this, no further road works are anticipated. The section of St Helens Point Road between Sandpiper and Penguin Streets which was sealed before Christmas will now be swept and new line markings applied. All streets will be open in time for the Australia Day Long Weekend. This completes the public infrastructure stage of the project for this financial year. Residents in St Helens Point Road and Parnella Drive who were affected by construction works for drainage improvements in Catchments 3 & 5 (see map) have been very appreciative of the way in which a few downpours in the area this year passed without incident or inconvenience. The new drains passed their initial tests very well, but are yet to experience their full design loading from the rarer events. Break O’Day did receive some very heavy rainfalls from Easterly storms in the last year, but Parnella was spared the worst of that weather. Those in the unimproved sections unfortunately were reminded of the forces of nature, particularly during a very intense rain event in January. Monitoring and evaluation of water quality in outfall drainage systems was required to satisfy Planning controls before further works could proceed. A Contract has now been awarded for improvements in Catchment 4, which runs from Hillcrest back into Parnella Drive, and works are scheduled to begin in mid-August and finish by November. Catchment 2 works, which will run from the area above Treloggens Track through Parnella Drive are now in the Tendering phase and are intended to follow on from Catchment 4 construction. Remnant State Government funding will be used to mitigate the more critical parts of the foreshore erosion along Georges Bay, but Council secured special loan funds to enable continuation of the drainage works on the higher ground. The drainage works listed above will complete an essential first phase in the reduction of groundwater coming out of Chimney Heights which was identified as the cause of erosion problems in the Georges Bay escarpment. 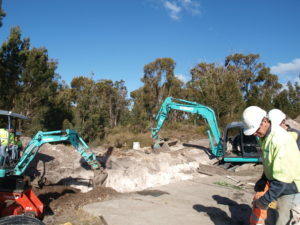 Once they are all in place, landowners will be encouraged to connect stormwater overflows from their properties into the new pipes instead of into soakage drains or onto open ground which might add to infiltration. Construction works on the new St Helens District Hospital in Annie Street is still on schedule for completion in November 2018. Site activities remain consistent with a lot of construction activity occurring as Fairbrother and their sub-contractors progress works internally and externally. Works in the coming months will include completion of the external cladding, windows and glazing. The carpark and access road base is being prepared ready for hot mixing later in the year. Internally plaster and vinyl works have commenced ready for joinery installation. Stormwater works in Annie Street are now completed with kerb and gutter work planned to be undertaken, by Council, in October once the hospital site works near completion. With the completion scheduled for late 2018 the existing hospital will remain fully operational over the Christmas/New Year period. Transition to the new hospital will occur in early February 2018.